Your parents and teachers will probably tell you that your primary school years will be some of the best of your life and hopefully you’ll have really enjoyed your time at primary school! Preparing to leave primary school is a very exciting time but it can also be a little bit scary. For most people, their primary school will have been the only school that they’ve ever been to. After all, for 6 years, you’ll have go just as used to the sights, smells and sounds of primary school as you are to your own home. 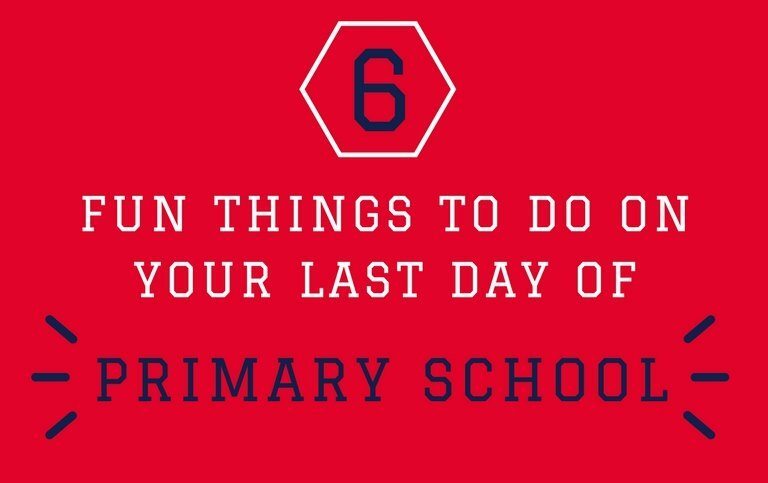 Even if you’re feeling slightly anxious about what will happen after you’ve left primary school, your very last day should be one to remember! Your final day is a time to put any worries or other problems aside and make sure that you really enjoy yourself! Your teachers will have seen you grow into the person that you are today. They will have taught you skills that you will use for the rest of your life, so make sure that you say thank you and let them know if you will miss them. Saying thank you will not only make them feel good, it will make you feel good too. You might be surprised by how much they care about your future, so if they say to keep in touch – make sure that you do! Some of the friends that you have made in primary school will remain your friends for years to come. Write a nice message in their yearbook or notepad, so that you can look back on what was important to you both and remember the good times you had at primary school, in a few years’ time. Ask if you can sing a song or do a dance in assembly or if you can do a relay race involving everyone in your year, for the whole school to watch at lunch time. Really mark the occasion – you’ll only have one last day at primary school! Your leavers hoodie will have the names of everyone in your year on it, which will help you to remember everyone and what they were like once you’ve left primary school. But it’s not just for after you leave! What better day to wear your leavers hoodie than on the day you leave primary school? For details of how your school can order leavers hoodies, to make every Year 6 leaver stand out on the last day of primary school this year, see our ‘Leavers Hoodies for Kids’. Do you remember your first day of primary school and how big everything seemed? It’s a good memory to keep and now it’s time to make another one! As a year 6 leaver, you probably know every room and every corridor in your school. Take a walk around everywhere and really drink in the atmosphere of your school hall, your classrooms and where you like to play at lunch time. That way, whenever you look at your yearbook or wear your leavers hoodie, you’ll be transported back to clear memories of your last day at primary school. You’ll hopefully have spent most of the day enjoying your last day at primary school and making happy memories. Now, looking forward, write down a short list of things that you want to do in your school holiday. It could be having a picnic with your family, having a sleepover with your best friends or completing your favourite computer game. If you think about the things you want to do and write them down, you can keep track of your goals throughout the school holidays, which will make you more likely to achieve them before you start at secondary school.